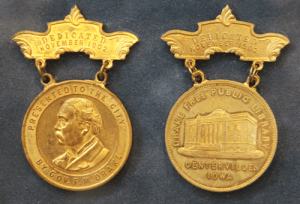 Two original medallions from the 1903 dedication ceremony. One was in the library and one was found in Georgia in 2012. A man bought a box of “junk” from an auction and found the medallion in the bottom of the box. He researched the library online and called wanting to donate it to the library. January 15, 1903: Hundreds of people arrived in town for the dedication of Drake Public Library. From Des Moines, two special trains traveled the Wabash and Central train tracks. One carried Iowa’s governor, Albert Baird Cummins and 300 state officials. The other brought 500 Drake University students, including their band and glee clubs. Guests were served food at the Armory Opera House, at the Presbyterian Church and at another building given by Drake to the town, the Central Church of Christ on Drake Avenue. One thousand bronze medals were sold at 25 cents each. On the steps of the library, Governor Cummins gave a speech. Ex-governor Drake lifted a key. He unlocked the door and handed the key to Mayor Callen. People cheered. Unknown then, the opening of the Drake Public Library would be Drake’s last public event. Enfys McMurry Appanoose County History published in Daily Iowegian. Portrait of Governor Francis Marion Drake hanging behind the Circulation desk on the main floor. ….”And yet another revelation greeted Drake. 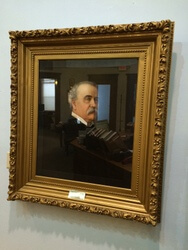 The Daily Citizen reported it thusly: “When Governor Drake entered the library with Governor Cummins and his party, he was greeted with another surprise, for there in a conspicuous place was a life sized portrait of himself handsomely mounted and framed in gold leaf….” Incidentally, this portrait still hangs in the library. Drake visited the library in early March of 1903 and decided more furnishings were needed and told the Library Board “he would pay for it.” He gave them $700 with the understanding if still added funds were required, he would cover the cost. 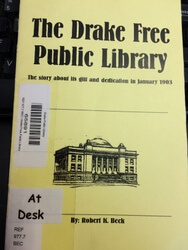 Pamphlet on file at Drake Public Library. Compiled by local author and business man, Robert K. Beck. Drake University was established in Des Moines, Iowa in 1877. The Drake gift proposal was formalized by an April 9, 1901 letter to “The Honorable Mayor and the City Council of Centerville, Iowa.” Therefore Centerville did not choose a library over a university. This is a myth that has circulated for years! Amazon will donate 0.5% of the price of your eligible AmazonSmile purchases to Drake Public Library whenever you shop on AmazonSmile. ©2019 Drake Public Library | All Rights Reserved.